November 1, 1934: The first night of a week’s worth of appearances by “The Garland Sisters” at Grauman’s Chinese Theater” in Hollywood. The sisters appeared prior to the film The Count of Monte Cristo. Hardly a new act, this trio of youngsters has been kicking around the coast for two years, but has just found itself. As a trio, it means nothing, but with the youngest, Frances, 13 [sic], featured, it hops into class entertainment; for if such a thing is possible, the girl is a combination of Helen Morgan and Fuzzy Knight. Possessing a voice that, without a p.a. system, is audible throughout a house as large as the Chinese, she handles ballads like a veteran, and gets every note and word over with a personality that hits audiences. For comedy, she effects a pan like Knight, and delivers her stuff in the same manner as the comic. Nothing slow about her on hot stuff, and to top it off, she hoofs. Other two sisters merely form a background. Kid, with or without her sisters, is ready for the east. Caught on several preview shows, including the 5,000 seat Shrine Auditorium here, she never failed to stop the show, her current engagement being no exception. 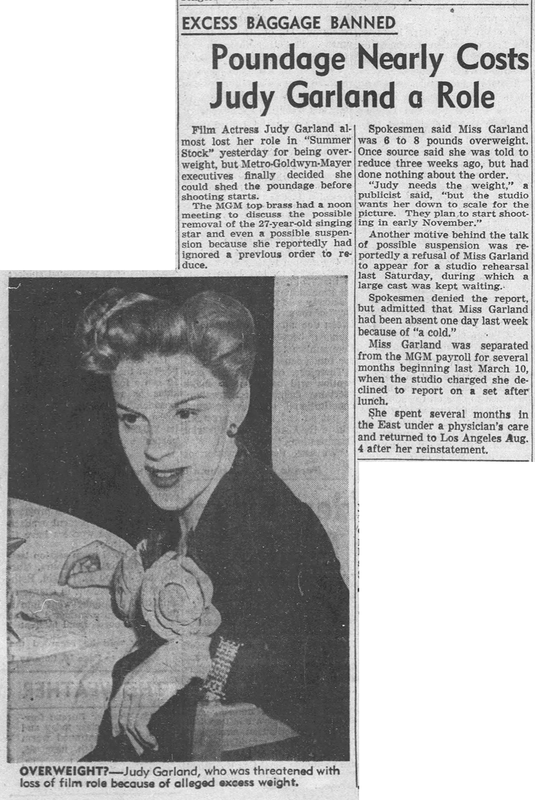 November 1, 1935: In his column, Wood Soanes notes the absurdity of MGM’s press release stating that Judy Garland “wandered” onto the MGM lot and auditioned. 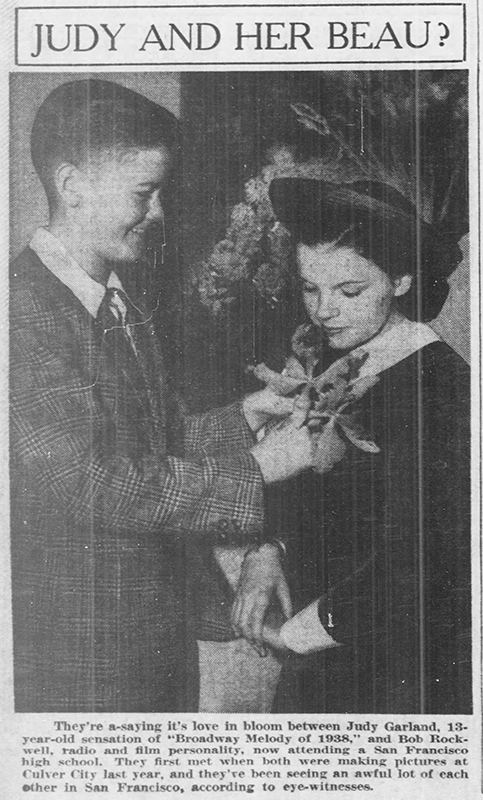 November 1, 1937: Judy has a new beau, plus an article about perfume and skin care for young girls has nothing to do with Judy aside from using her photo to get people to read it. 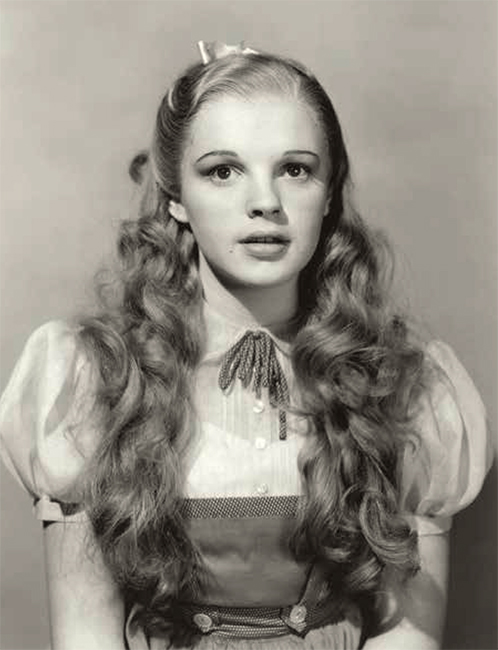 November 1, 1938: Although Judy was already in the last days of makeup, hair, and costume tests for the new brunette Dorothy, MGM publicity was still circulating the story that Judy was a blonde for the first time. 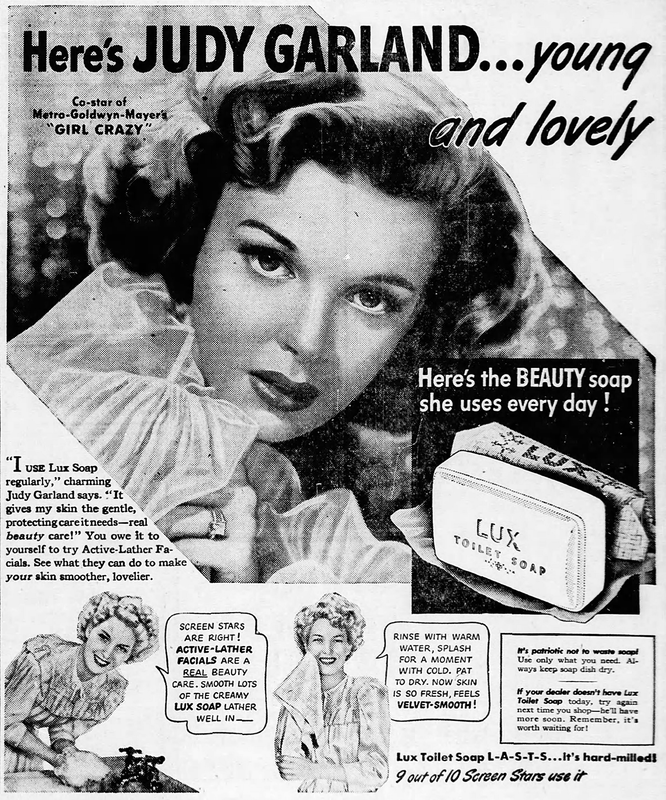 November 1, 1943: Another wonderful Lux Soap advertisement. November 1, 1944: Ziegfeld Follies had a sneak preview at the Westwood Village Theater in Los Angeles. The film premiered on August 13, 1945, as Ziegfeld Follies of 1946. It then went into wide release on April 8, 1946. 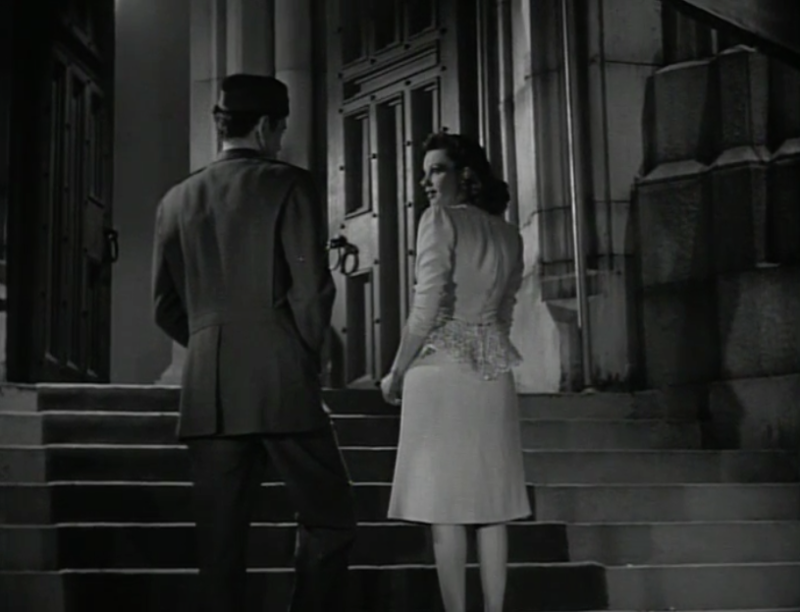 The delays were due to the revue format of the film allowing for many numbers to be filmed and then discarded. 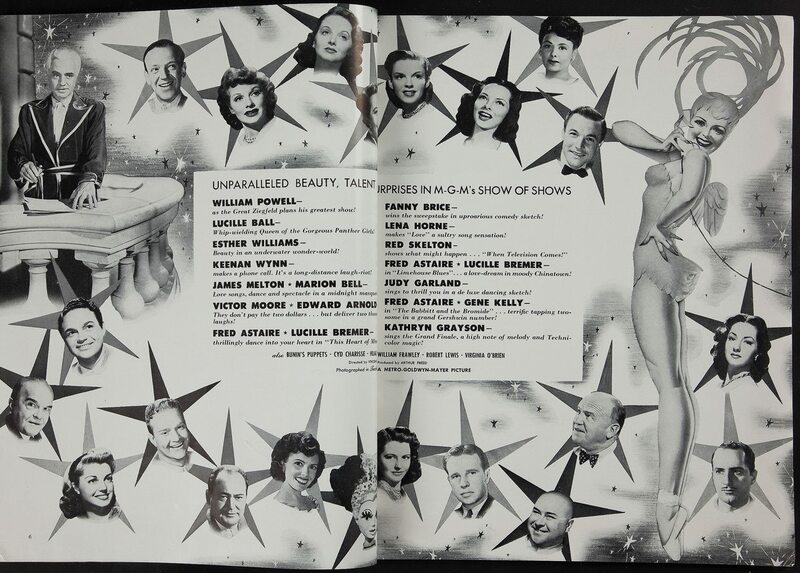 Photo: Two-page spread from the November 1945 “Lion’s Roar” publication featuring what became the final line-up of acts featured in the film. 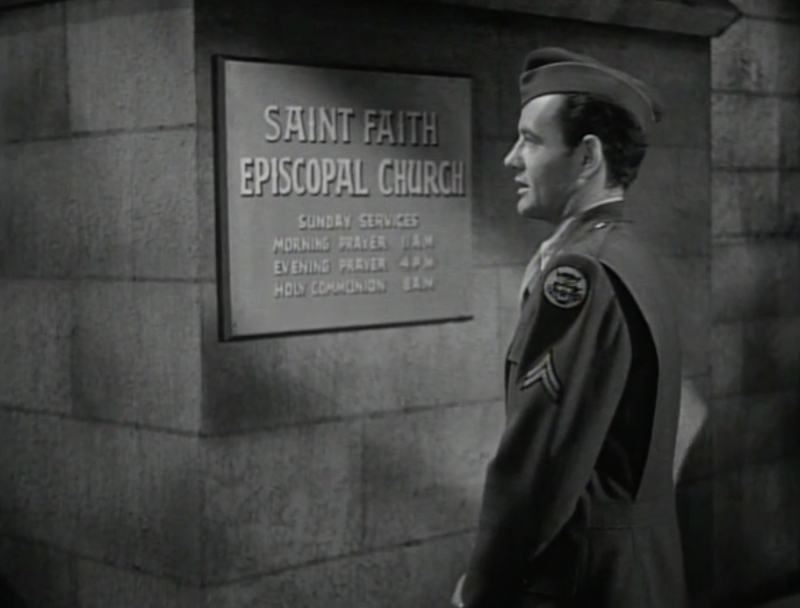 November 1, 1944: The Clock filming continued with scenes shot on the “Exterior Saint Faith Episcopal Church” set. 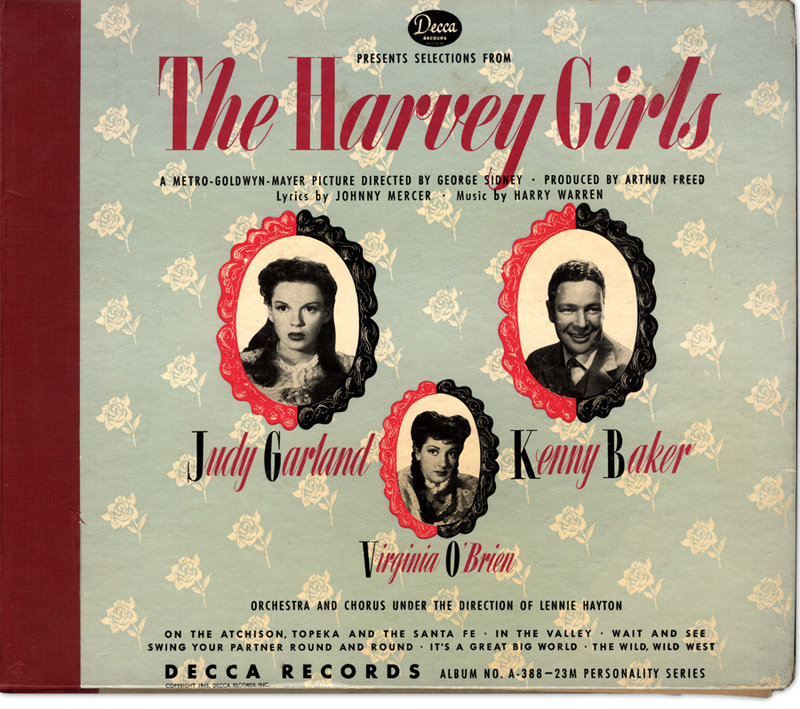 Time called: 10 a.m.; dismissed: 5:15 p.m.
November 1, 1945: Decca Records released the “cast album” of songs from The Harvey Girls. The album was not a soundtrack album but actually studio recreations of numbers from the film. Actual soundtrack albums would not be on the market until 1947. This was the third, and last, of Decca’s “cast albums” of Judy Garland films. MGM Records was formed the following year and put out their first soundtrack album in 1947 featuring soundtrack recordings from Till The Clouds Roll By. What makes this album even more special is the care with which Decca took to emulate the performances in the film The Harvey Girls (1946). Most of the film’s cast was involved, including Kenny Baker and the wonderful Virginia O’Brien. The arrangements were identical to those used in the film because Decca brought in MGM’s Musical Director Lennie Hayton and Vocal Arranger Kay Thompson to repeat the work they had done for the soundtrack prerecordings. 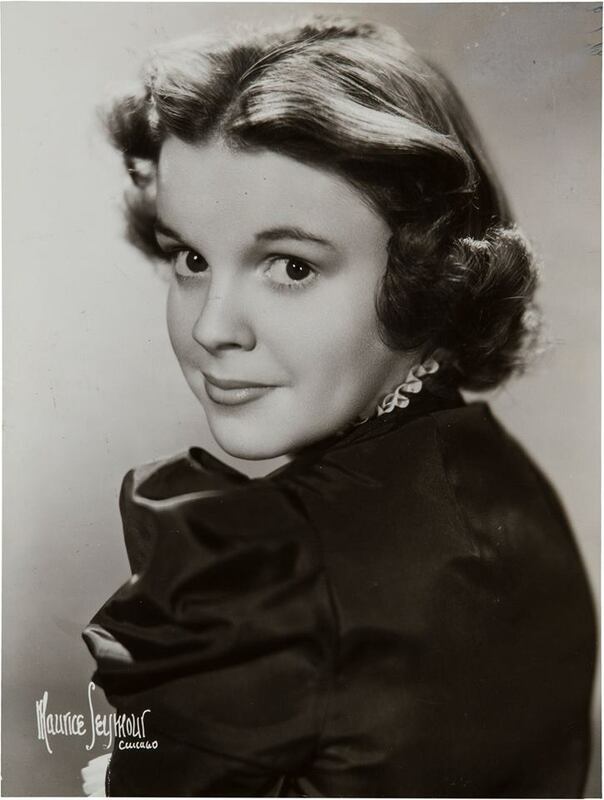 Check out The Judy Garland Online Discography’s The Harvey Girls pages here. 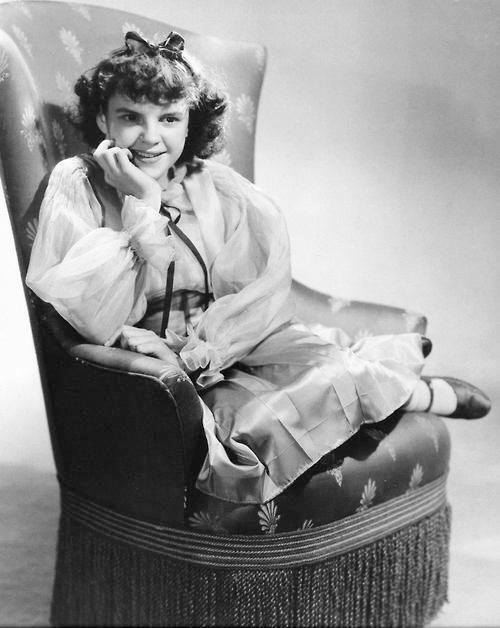 November 1, 1945: Filming on Till The Clouds Roll By was planned to continue, however, Judy went home sick at 11:30 a.m. Judy had a 10 a.m. call, she arrived on the set at 11:00 a.m., then was dismissed at 11:30. Nothing is noted as being filmed on this day. 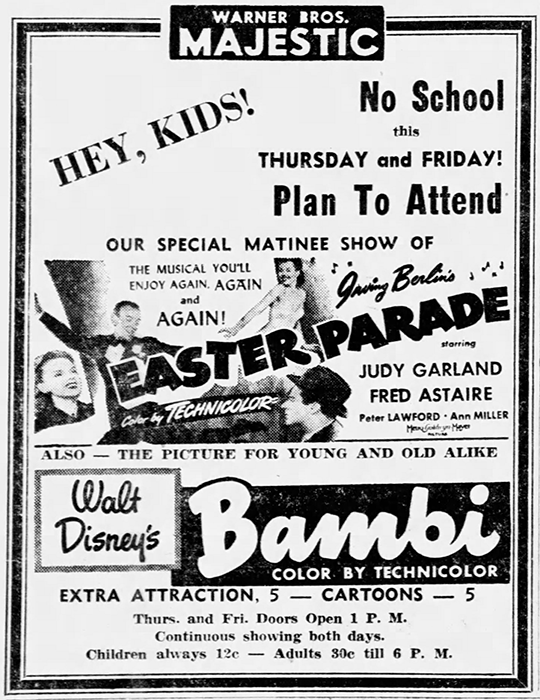 November 1, 1948: Easter Parade was, and still is, a film for all ages. 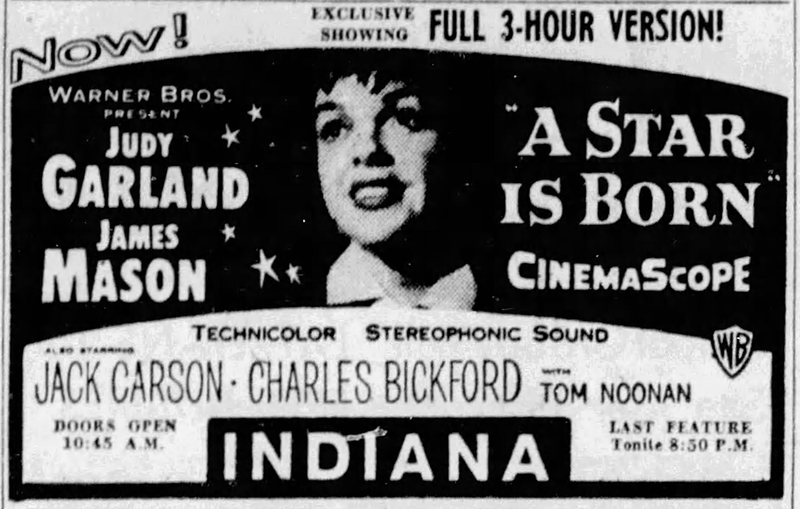 This ad marketed the film to local kids in Sheboygan, Wisconsin, along with Disney’s Bambi, which makes for an unusual double bill. 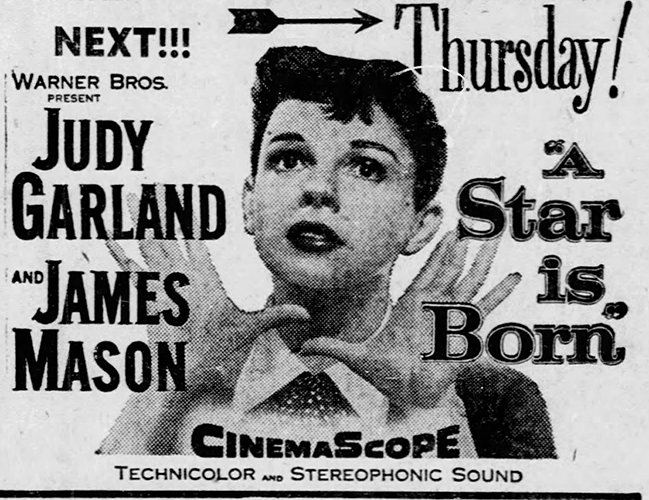 November 1, 1949: Judy is too fat! 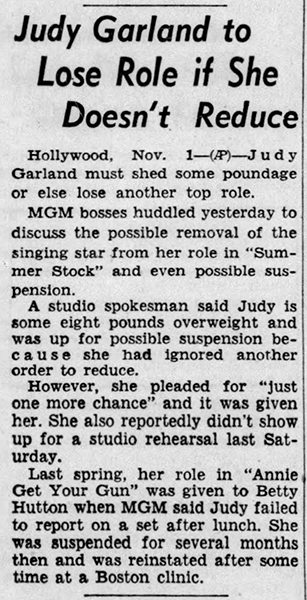 Here are examples of the news, which was in most papers, about Judy’s weight gain, with the famous (to Garland fans) headline “Excess Baggage Banned.” What’s interesting about this is that Judy was currently filming Summer Stock and producer Joe Pasternak wasn’t as concerned about her losing weight as these articles make it seem, although “the front office” of MGM certainly was. It’s no wonder Judy had a complex when her weight was fodder for the columnists and would continue to be throughout the rest of her life. 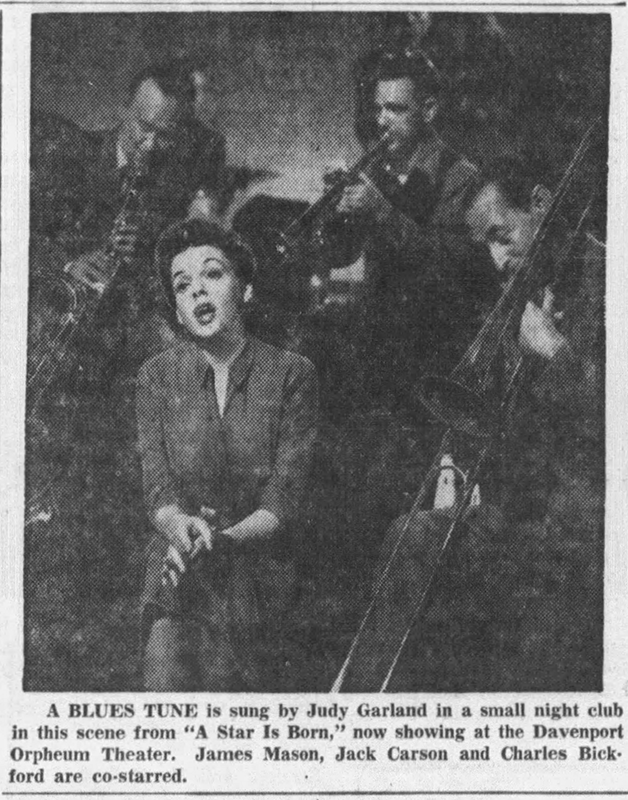 November 1, 1950: Judy was barely out of her contract with MGM when talk of her comeback began. 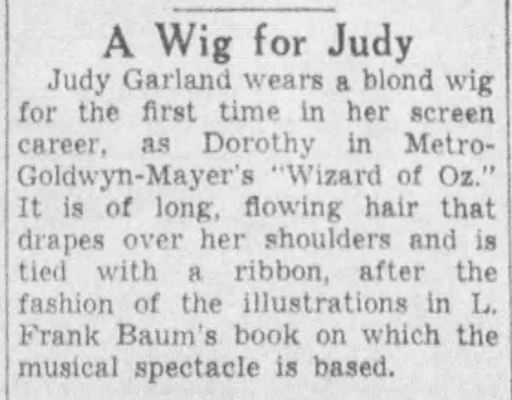 Also shown here is a paragraph from Erksine Johnson’s column noting who would be taking over Judy’s roles at the studio. 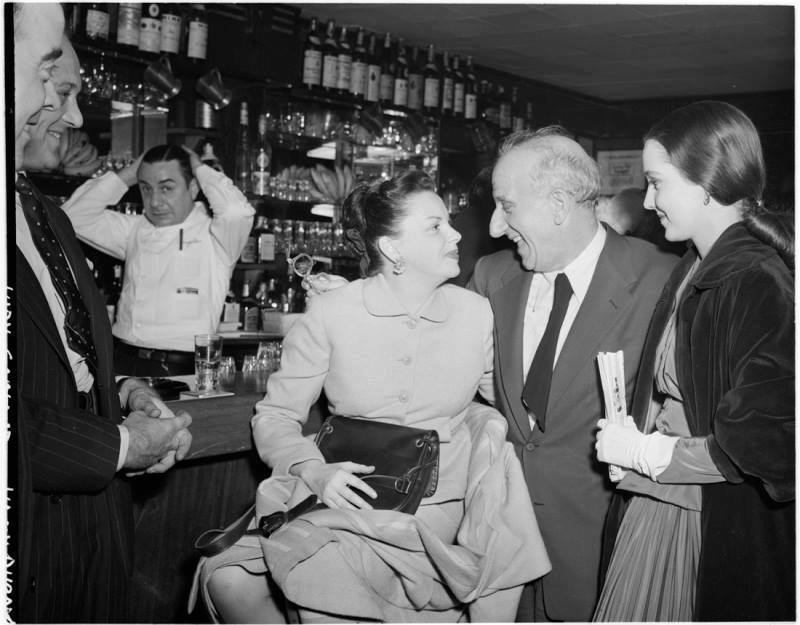 Photos: Judy is seen with Sid Luft, Jimmy Durante, and others. 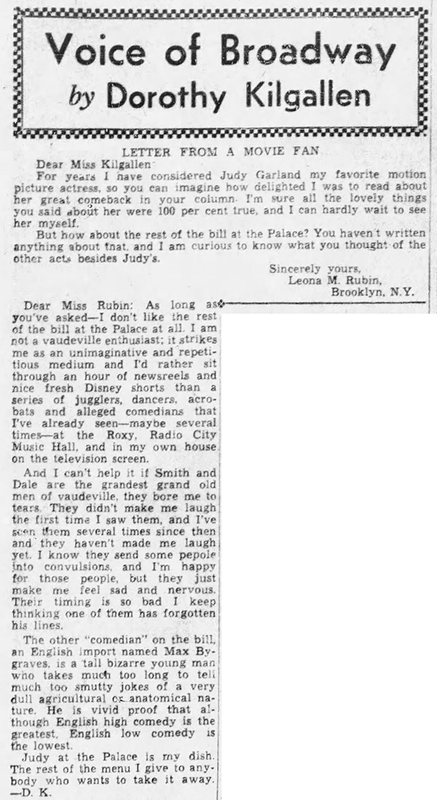 November 1, 1951: In her latest column Dorothy Kilgallen responds to a reader’s letter asking about Judy at the Palace. Kilgallen loved Judy, of course, but didn’t love the rest of the bill. 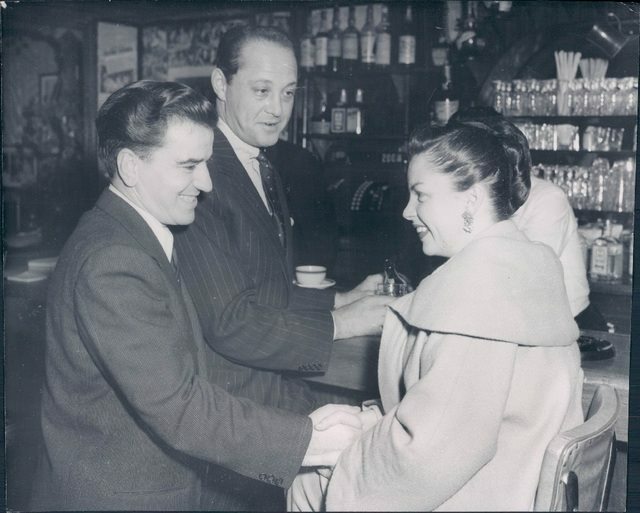 November 1, 1954: Judy and husband Sid Luft were recently seen at LePavillon in Manhattan. A Star Is Born was still opening in theaters around the country. Note how one ad specifies that they’re showing the “full 3-hour version” which indicates that although Warner Bros. had pulled the complete version and was sending out the edited version, some theaters still played that complete version. 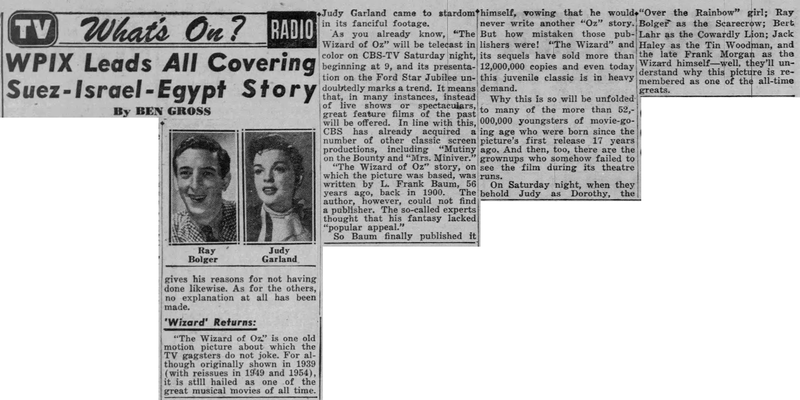 November 1, 1956: The upcoming premiere of The Wizard of Oz on TV was making the entertainment news. 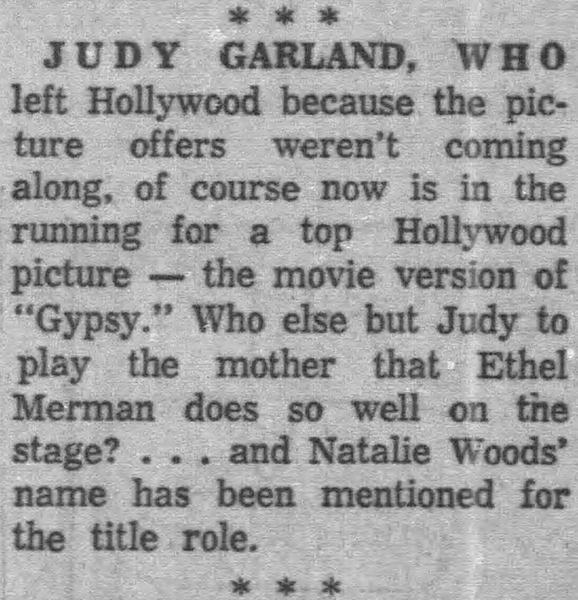 November 1, 1960: It’s been one of the top, if not the top, roles that Garfans have wished Judy had played on film, “Mama Rose” in Gypsy. 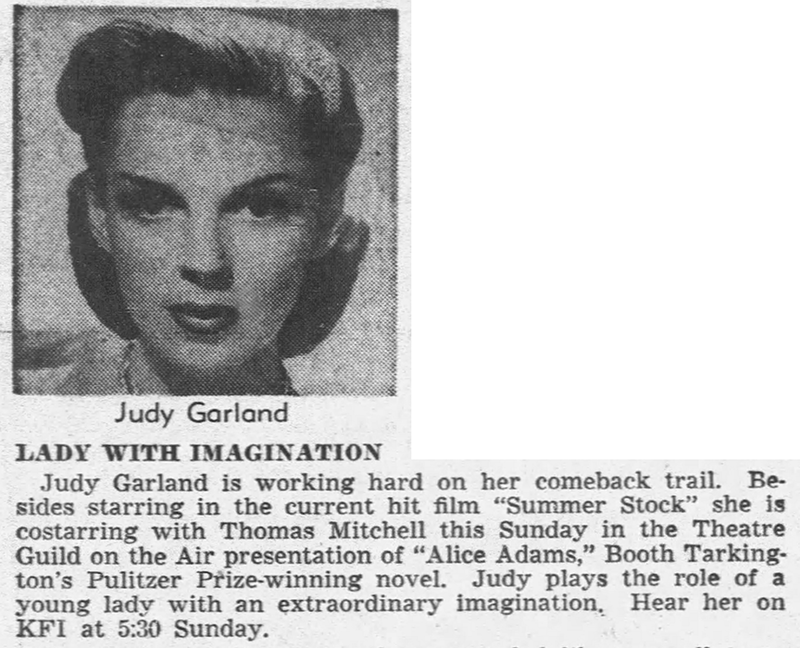 Here columnist Sheilah Graham notes that Judy, who else? should play the role in the film adaptation. Judy would have been phenomenal and probably would have been nominated for an Oscar. She didn’t get the role, though, it went to Rosalind Russell. November 3, 1963: Episode Twelve of “The Judy Garland Show” at CBS Television City, Stage 43, Hollywood aired on CBS-TV. The show was taped just two days prior on November 1, 1963, which was a fast turnaround. Judy’s guests were Vic Damone and Zine Bethume. The article above, about the ups and downs of the series, was published on this day. November 1, 1966: Judy’s TV series was leased to the Los Angeles based KHJ (Channel 9) via the media company RKO General West Coast. 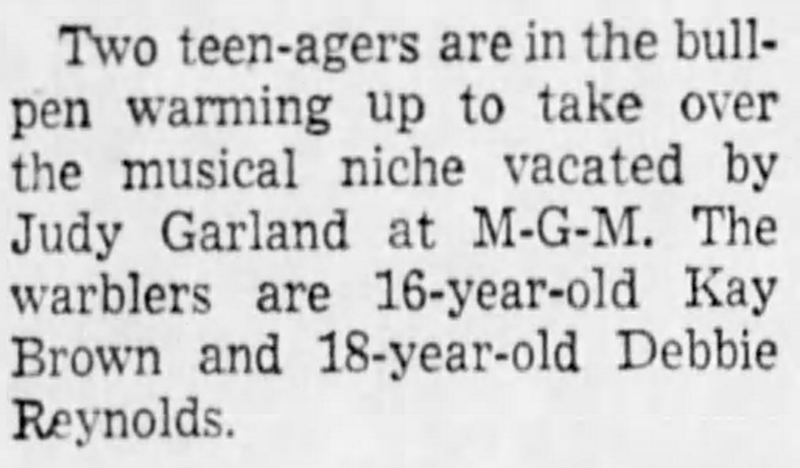 November 1, 1967: “The Judy Garland Carnegie Hall Fan Club” of Carnegie Melong Bank was lobbying to get Pittsburgh, Pennsylvania, added as a stop on Judy’s “The Palace” tour. Had no idea that the long version of “A Star Is Born” ever played simultaneously with the cut version. Your “On This Day” series is a gold mine of information, Scott! 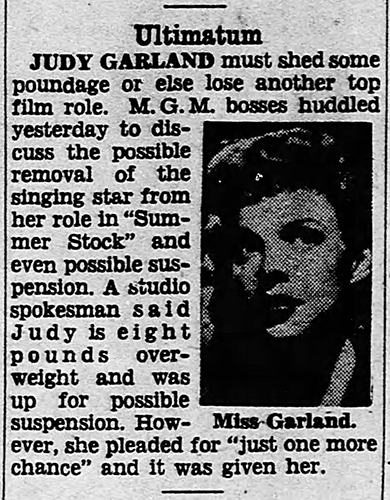 “Eight pounds?” I’ve read elsewhere that Judy was at least twenty pounds overweight in “Summer Stock.” And in much of the picture she looks it! I love her, and always have, but she did look much more attractive when slim (I, for one, think she’s great in “For Me and My Gal”). But you are right…the columnists seemed to be always mentioning her weight, no matter what it was. I thought her weight “Perfect” in “Presenting Lily Mars” and “The Clock.” She just looked so healthy in both films.